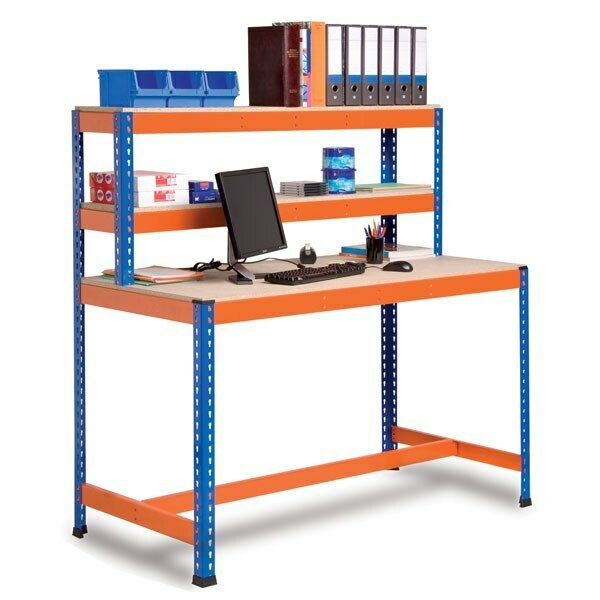 This worktable with a double ledge and foot rest is designed to perform tasks that require sitting. Thanks to its solid particle board work surface and a convenient double ledge that allows all kinds of tools and other implements to be just within reach, it is particularly suitable for working on hobbies and crafts or modeling projects, as well as for jewelry and watch workshops, etc. Choose between two different table heights, as well as the most convenient footrest height position, which provides maximum comfort to the user. Also, shelf height can also be adjusted to the ideal position for each type of work, by fitting the endplates of the orange beam into any of the perforations of the metal profile. Boltless assembly. The pieces click-together easily with the help of a rubber mallet. This product protects the health of the users by adopting ergonomic principles that optimize efficiency and well-being. Capacity of up to 1,000 lbs per unit. Includes 6 vertical posts with plastic feet, 1 shelf, 1 footrest, and 2 top shelves. Deep top shelves: 12", 18".